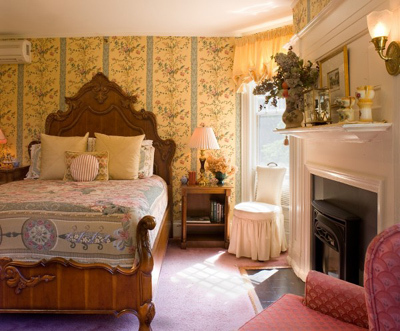 Few Newport bed and breakfasts take you back into the Gilded Age like the beautiful Ivy Lodge. 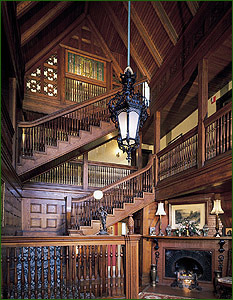 Upon entry, you'll be greeted by the stunning 33 foot gothic oak entry hall, victorian furnishings and amazing woodwork, and you'll know you're in for a special stay at a special inn. 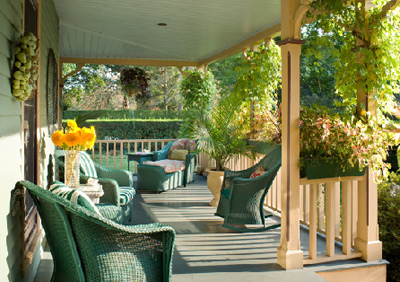 Ivy Lodge is located just off of historic Bellevue Avenue, and is easily within walking distance of downtown, the Newport mansions, Easton's Beach and the breathtaking Newport Cliff Walk. Start off each day with a mouthwatering gourmet breakfast (made to order every day) in the dining room, and enjoy some down time reading a book or relaxing by the fireplace in the sitting room, the victorian living room or outside on the porch. This spacious room is the most popular in the house. It has a king-sized four poster canopy bed, private bath (with a 2-person whirlpool tub), and a flat-screen television with cable and a DVD/VCR. The Governor of California (and former actor), Arnold Schwarzenegger stayed here with his wife Maria Shriver years ago. This may have been around the time when Arnold was filming the movie True Lies down the street at Ochre Court and Rosecliff mansions. Click here to view the famous tango scene from that movie, which was shot in Rosecliff's ballroom. As the name implies, this is the perfect suite if you're traveling with your family, and sleeps up to 4 people. 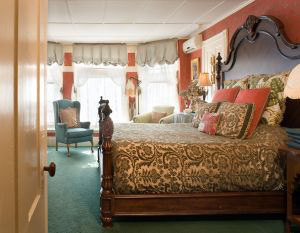 Located on the 2nd floor, it has one large room with a king sized bed with a raised fireplace, and a smaller room with a trundle and 2 twin sized beds. The large room has a TV with a DVD/VCR above the fireplace, and a hidden refrigerator behind the book cases. The smaller room also has cable TV, and there is a large bathroom with a 2-person shower and 2-sink vanity. 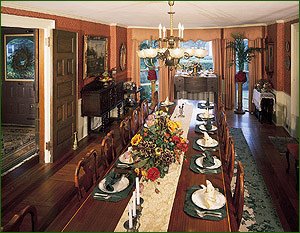 The Victoria Room, also located on the 2nd floor, is decorated in monotone fabrics and wallpaper with blonde furnishings. 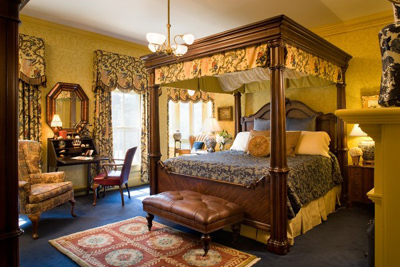 This room has a king sized bed, a raised fireplace and a private bath with a 2-person whirlpool tub. 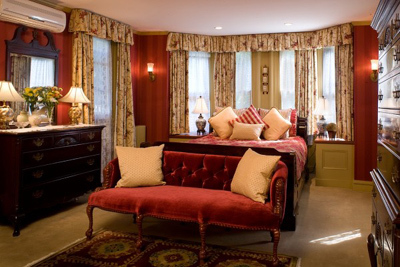 If you're in Newport for a wedding, this is the perfect bridal suite. The Van Allen room is also on the 2nd floor. It's newly remodeled, with a king sized bed and access to a small balcony. The Library room is the only guest room on the 1st floor (allowing you to beat everyone else to gourmet breakfast in the morning!). It has a queen sized bed and fireplace, and a TV/DVD/VCR and small refrigerator hidden in the cabinetry. 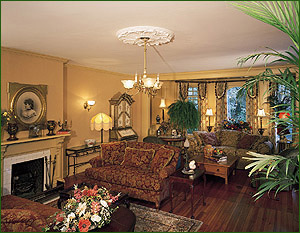 The spacious and sunny Magnolia Room, inspired by the town of Savannah, Georgia, is located on the 3rd floor of the inn. It has a queen sized bed, fireplace and many windows. This room has a private bath with just a shower, and is equipped with cable television. Also located on the 2nd floor, the La Chambre Jaune Room is furnished with hand-painted Bombay chest and French country prints. 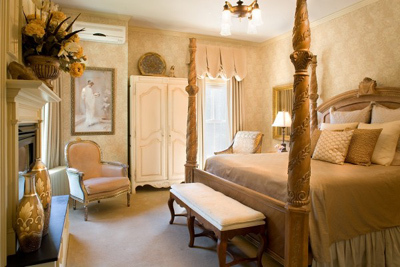 It has a Cour de France queen sized bed and access to a small balcony. 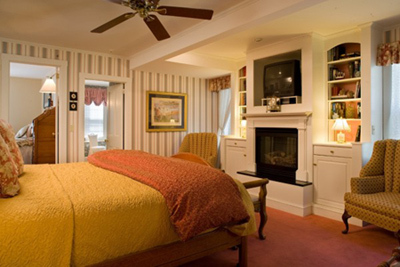 This room also has a private bath with a whirlpool tub, fireplace and cable television. 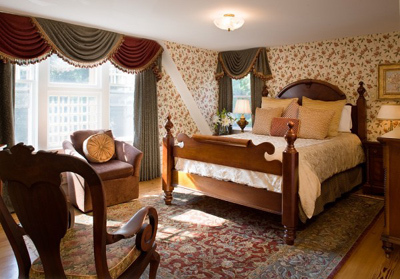 The spacious Queen Anne Room is located on the 3rd floor, and is ideal for families, sleeping up to 4 people. It has a king sized bed, and a day bed with a twin bed on top and a twin trundle underneath. How we process your reservation request: If you are staying for one night, we take the one night room rate plus taxes, R.I. State tax 7% and Lodging tax 6%, if you are staying two nights, we take the first night deposit plus tax, the remaining amount of your balance is due at the time of check-in. If you are staying three or more nights, we take half the amount of your stay as deposit plus taxes, the remaining amount is due at the time of check-in. Should it be necessary to cancel a confirmed reservation 14 days prior to your arrival date, your deposit will be refunded less a 10% service fee. If you cancel within the 14 days of your arrival time, your deposit will be forfeited. For confirmed guests not arriving on the scheduled date and without prior notification, your deposit will be forfeited and if additional room nights were reserved, the room will be open for availability the following day. Guests leaving early will not be entitled to a refund for any part of their reservation. 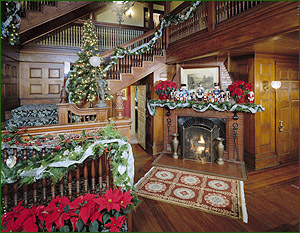 The inn is staffed from 8:00 a.m. until 6:00 p.m. Guests who anticipate arriving after 6:00 p.m., should inform the reservation staff member at the time the reservation is made. 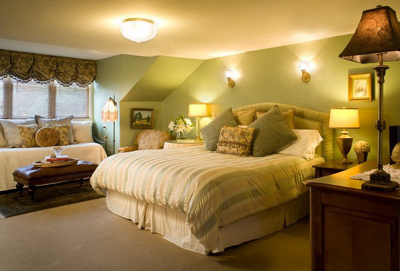 We have a way to ensure that late arriving guests are able to gain access to the inn and find their guest bedroom. If you have significant dietary restrictions (e.g., allergies, vegetarian/vegan preferences, etc. ), please let us know as soon as possible so that we can accommodate your needs. 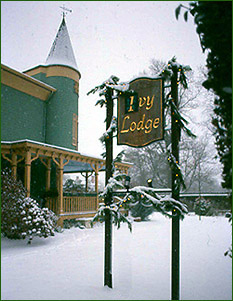 The Ivy Lodge is a smoke-free inn. If it is deemed that a guest has smoked in their rooms or in any other interior space on the property, there will be assessed an odor removal fee (minimum fee of $250). 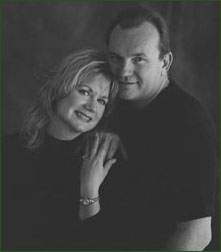 Our philosophy is that we want our guests to feel as though our house is an extension of your house. We happily accommodate children. To date our minor guests have been a delight and we appreciate well-behaved children! Romance Package - Champagne, chocolate and flowers! To book reservations or for more information on one of the finest Newport bed and breakfasts, simply contact the lodge at the number below.